An inspired collaboration of design & architecture Limassol Del Mar has announced a landmark collaboration with the world renowned Italian interior design company Jumbo Group for the furnishing of the Cyprus’ flagship seafront development The Signature Collection furnished by Gianfranco Ferré Home. Dine overlooking the crystal clear waters of the Mediterranean Sea, take a stroll on the beautiful sandy beach, pamper yourself with world-class shopping on our prestigious promenade and rejuvenate with an array of five-star sea-facing leisure amenities. 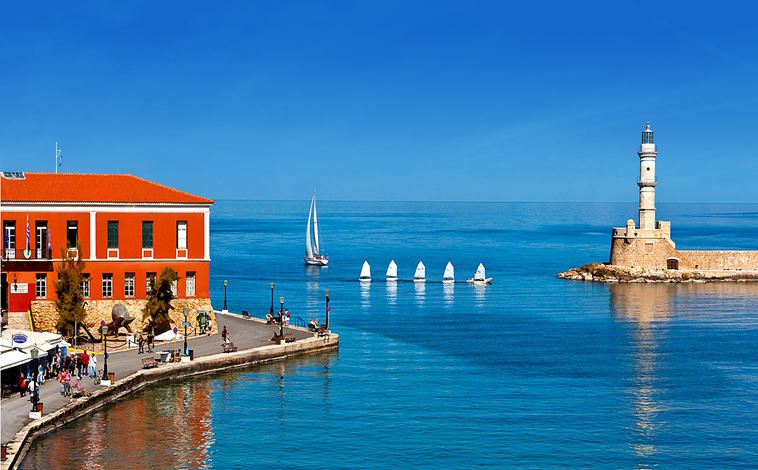 Paphos with its mild climate, natural beauty, historic sites and rich heritage is a cosmopolitan resort that has something for everyone at any time of the year. The relaxed tempo of life offers visitors and residents tranquility and peace, few places in the world can offer. Construction in full progress, have a look at our new timelapse video! 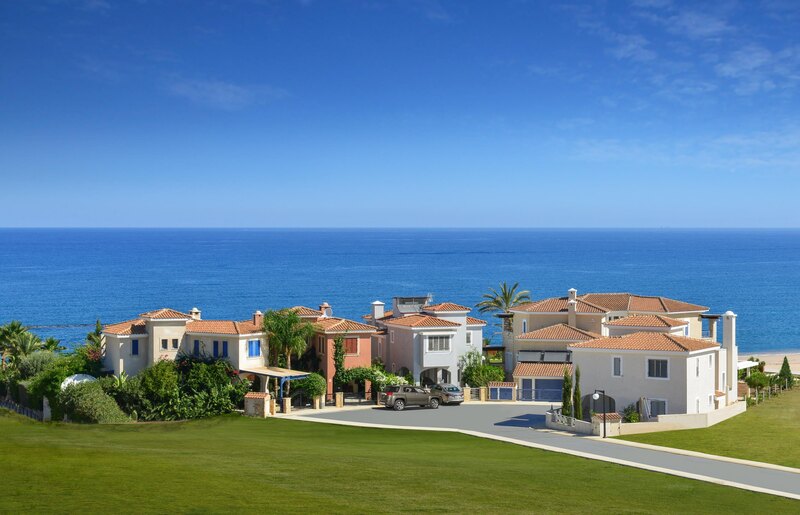 “Leptos Coral Seas Villas”, is superbly located on the coastline in a pristine area of picturesque Coral Bay, within walking distance to the 5 Star Coral Beach Hotel and Resort and Coral Thalassa Hotel, a 10 minute drive to the cosmopolitan town of Paphos to the south east and the Akamas Peninsula, a unique natural preserve to the north. The area is very popular with International holiday makers who are either living permanently in Cyprus or have invested in a holiday home. 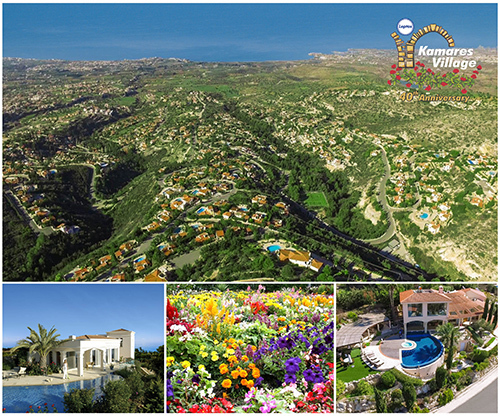 The Leptos Group is proud and at the same time delighted to announce the launch of its brand new website www.kamaresvillage.com dedicated to the 5 stars Internationally Award Winning Development Leptos Kamares Village. The new website which operates on a responsive layout has been designed to improve user friendliness and appeal to all devices. Celebrating one year from the Inaugural Stone Event in October 2017, we share again IN Business News coverage. 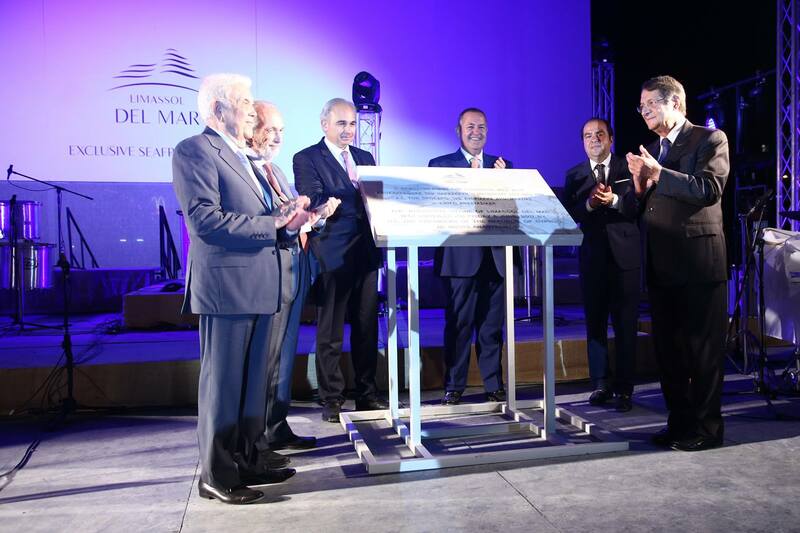 The foundation stone of Limassol Del Mar, a landmark development in Limassol, was unveiled in the presence of the President of the Republic of Cyprus Νίκος Αναστασιάδης (Nicos Anastasiades) and other prominent international and local personalities. 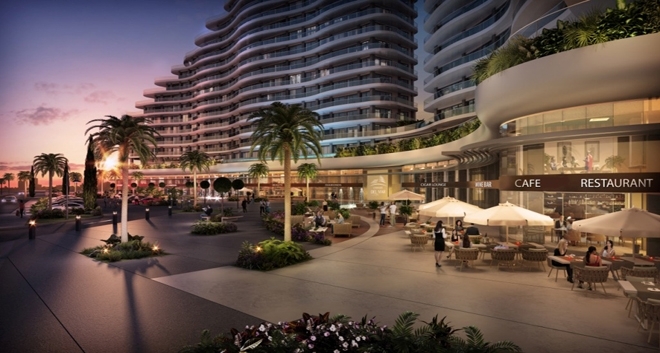 A world class development Limassol Del Mar is a fully licensed, pioneering and luxurious project, which constitutes a developmental milestone of high standards, not only for Cyprus but also worldwide. The construction works continue in full swing, following the schedule closely and uninterruptedly throughout the day and night. An impressive online timelapse video records the great construction progress, since the project has already reached the phase of the formation of the towers. Success continues in the months of September and October with the presence of Leptos Estates at International seminars and Exhibitions on Real Estate and Investment in the Middle, Far East and Europe. 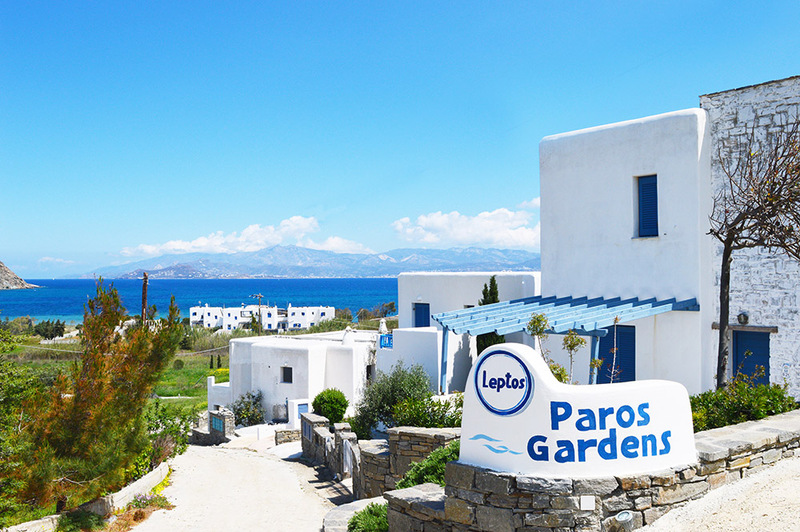 The Leptos Group currently has six new Seafront developments to present situated on the beautiful Greek Islands of Crete, Paros and Santorini comprising of an eclectic combination of seafront villas, apartments, penthouses and maisonettes. “Leptos Santorini Villas” is situated on the east coast , only few meters from the best sandy beach of the island, the Monolithos- Kamari beach, and within easy reach of Santorini Caldera undoubtedly one of the natural wonders on our planet . After the immense success of apartment sales of Phase I, which is now nearly sold out, the sales success continues with the second tower called “The Signature Collection”, exceeding every expectation. 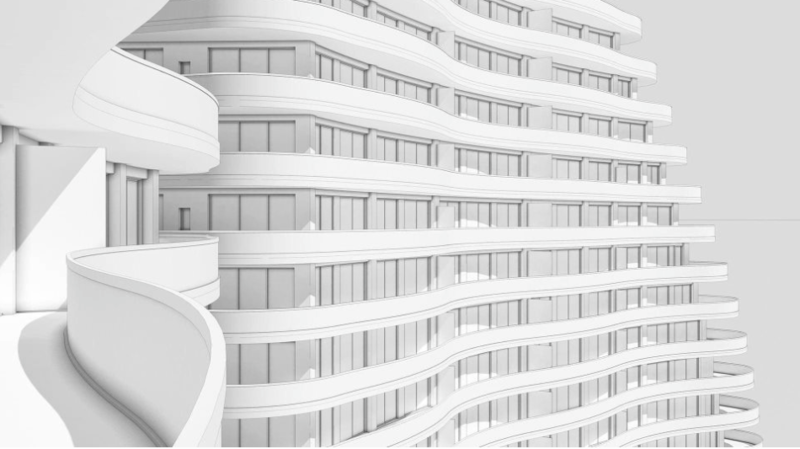 Notable is also the fact that the overall investment is covered by the income derives from the apartment sales, which already ensures the funding of the project’s completion and on-time delivery. 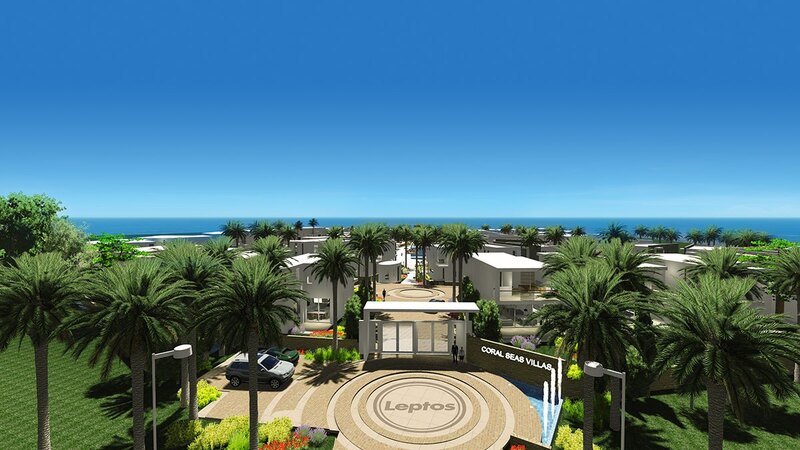 Leptos Estates is proud to announce that “Limassol Del Mar” has exceeded its sales targets and that has secured the funding of the project, expecting the first property deliveries in 2019. 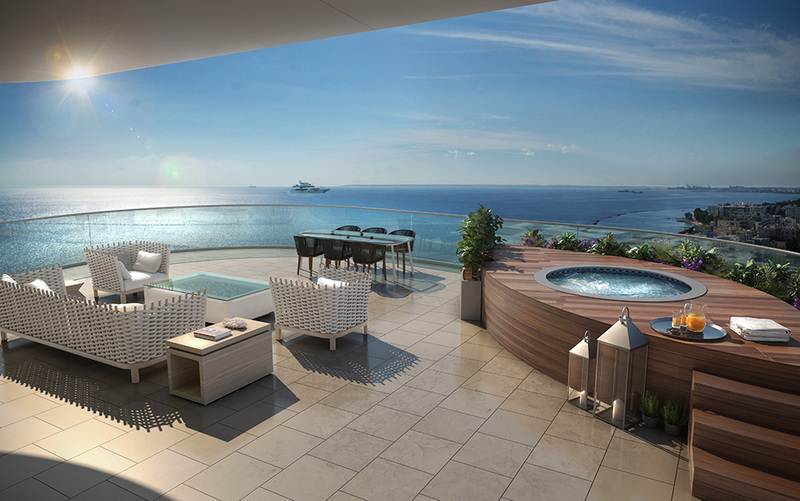 Living by the sea represents the highest Level of luxury for many home owners. 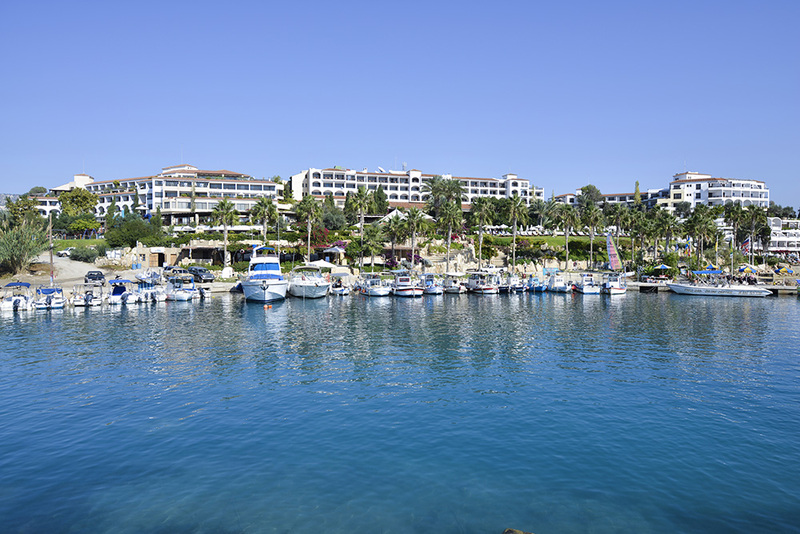 For those dreaming of a unique waterfront property, Paphos and especially the west coastal region of Cyprus is considered to be the best choice. 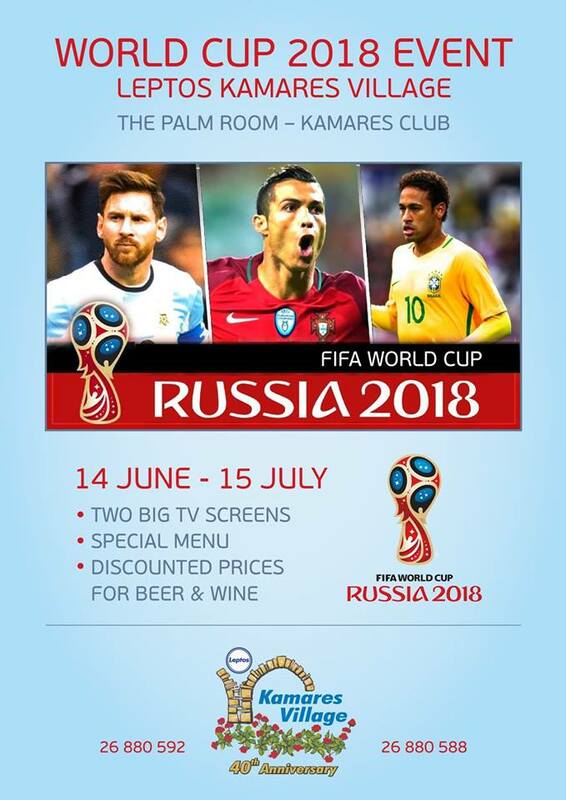 Kamares Club will be showing all the games of the World Cup!!! Leptos Kissonerga Beach Villas is a newly completed beachfront luxury project with exclusive Villas by Leptos Estates in Paphos, located in a unique seafront area, midway between the picturesque Paphos Harbour and magnificent Coral Bay. 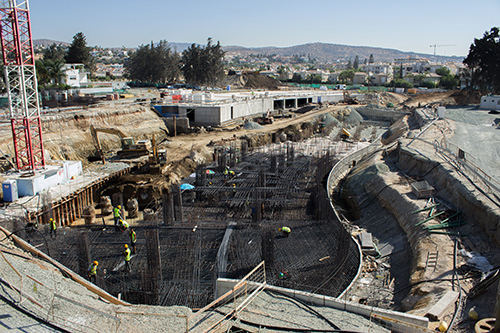 Providing priority to deadlines and delivery targets aiming 2019, Limassol Del Mar, the fully licensed project, is working intensively towards achieving those goals. Following the great success of the first three phases of the “Venus Gardens” Development, one of the most top selling projects in Cyprus, Leptos Estates will begin a new phase this month with advanced designs and distinct Mediterranean features. 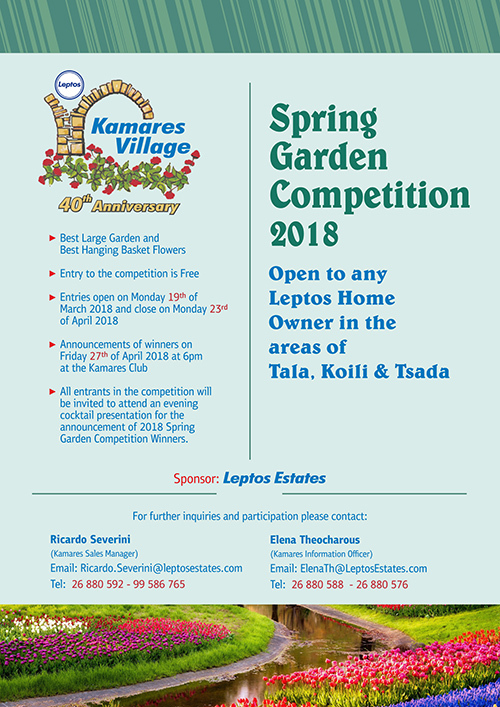 A large Spring Garden and Flower Competition is organized by the Leptos Group for its homeowners (around 5000) in the areas of Tala, Koili and Tsada. 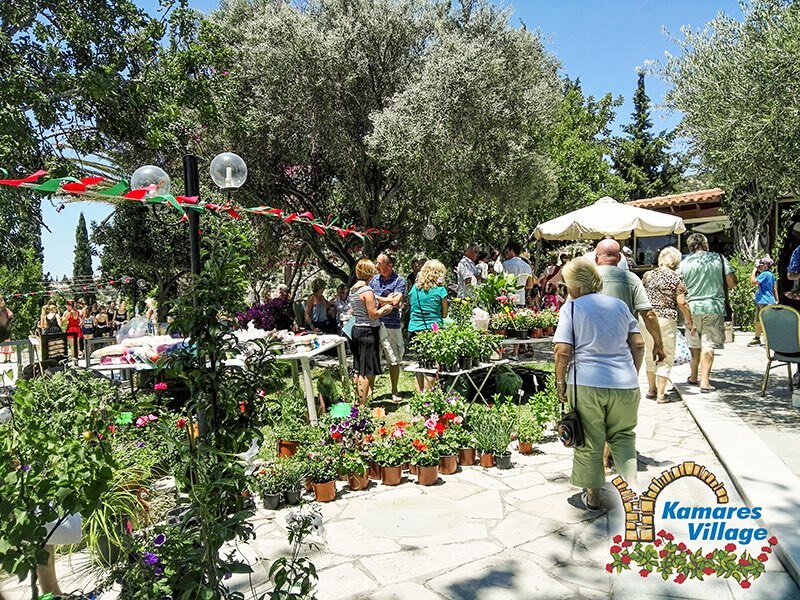 The focal point of the competition is the Kamares Village, which is adjacent to the historic monastery of Agios Neophytos and is celebrating this year its 40th anniversary. The execution of the project is expected to significantly benefit the Cypriot economy, as it will create hundreds of new job vacancies in both the construction as well as the services fields with the commencement of its operations. Open to any Leptos Home Owner in the areas of Tala, Koili & Tsada. Best Large Garden and Best Hanging Basket Flowers. 2019: Delivery of the first residences to their owners. 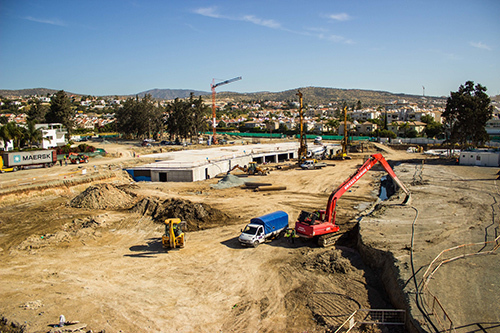 Cypeir Properties Ltd announces assignment of the construction works of Limassol Del Mar, the fully licensed luxurious project, to the consortium of companies, which includes Atlaspantou Co Ltd, MAN Enterprise, ICM Group and CMB Società Cooperativa. ara Design is an interior architectural design studio, specialising in the global residential and hospitality sector. 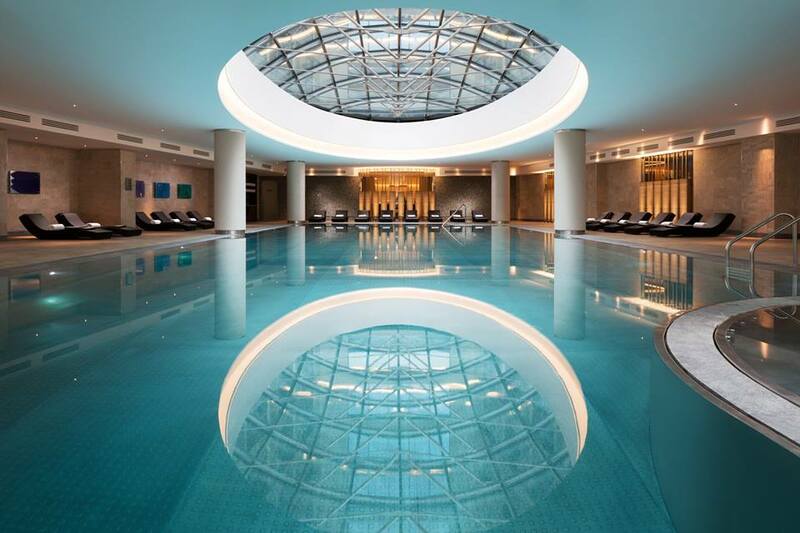 Ara design team has successfully completed interior design projects in more than 30 countries, which include private residences, 5-star hotels, resort spas, boutique hotels and restaurants. 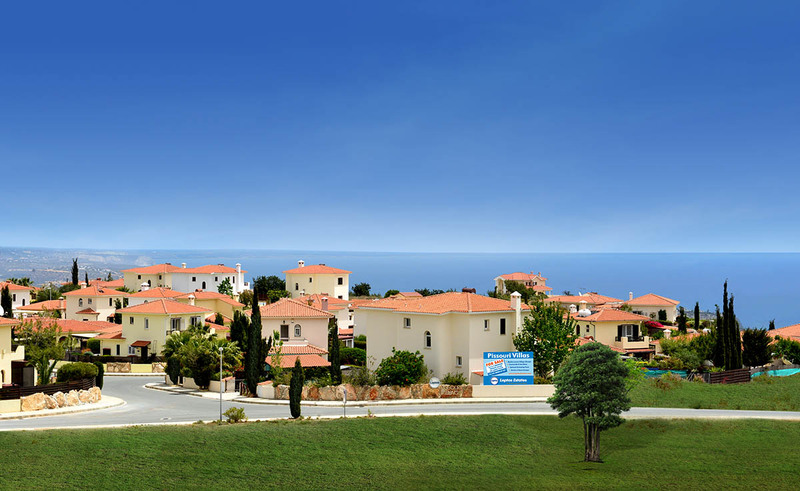 Nestling on the hills above Paphos, adjacent to the picturesque village of Tsada and close to the 18 hole championship golf course, with its Byzantine monastery, "Stavros tis Mythis", is the elegant development of “Vikla Villas” individually set in perfect harmony and quaint village setting. It’s February, the middle of winter and Leptos Kamares Village reveals its abundant beauty. Flowers, plants and fauna that can only be found in Cyprus invite you to look around, a haven for everyone that loves to observe nature. Aphrodite Gardens an exciting new project is set to be the most luxurious, gated resort residence in Paphos and at the same time has proven to be a very successful and fast selling project, due its ideal location, style, affordable prices and many amenities available. 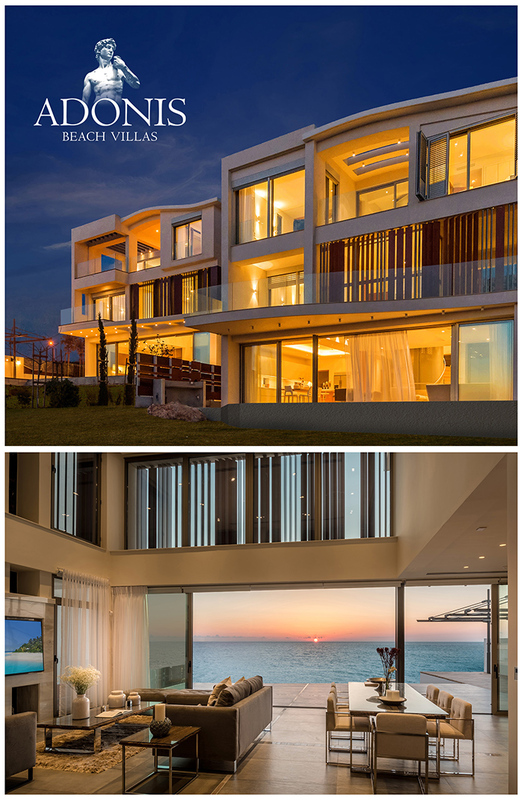 It’s been an amazing year for our Exclusive Seafront development in Limassol. We are proud and thankful for all teams involved to deliver this amazing project for our town. 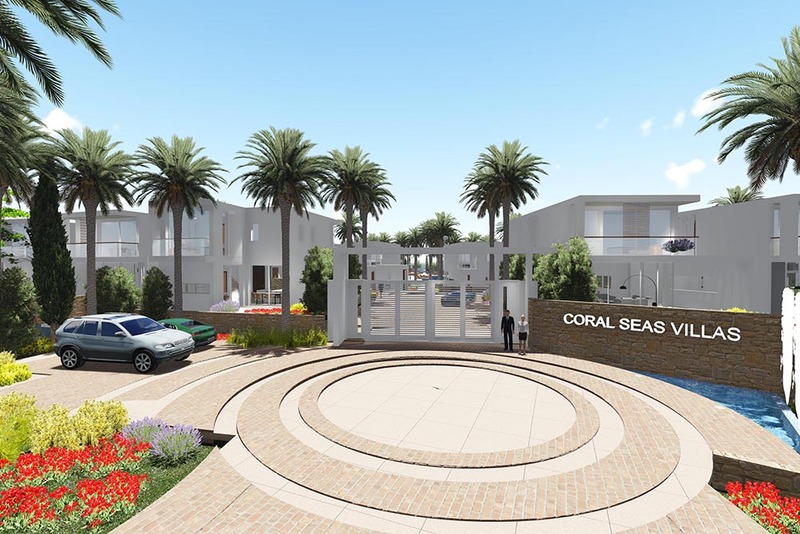 Following the outstanding success and super sales of its unique seafront projects “Coral Bay Villas” and “Sea Caves Villas”, Leptos Estates continues to enrich the cosmopolitan Coral Bay area with its exclusive modern seafront development “Coral Seas Villas” a new development that has been the best-selling project to overseas buyers for this Autumn. 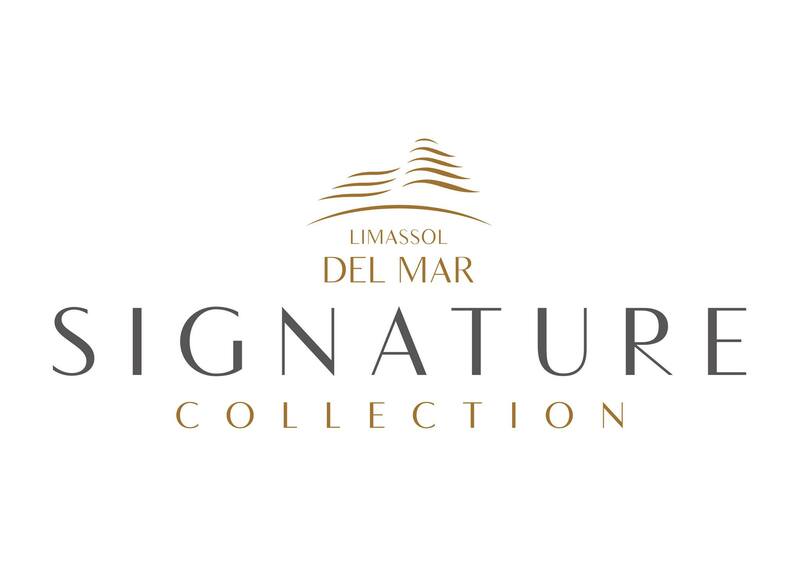 The already successful development, Limassol Del Mar, officially announces the launch of "The Signature Collection" apartments located on the 27-storey building. 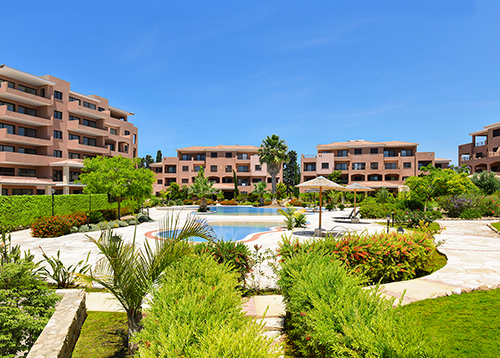 The apartments of this luxurious "collection" consist of two to five bedrooms, with first-class specifications and unobstructed view to the seaside. Cyprus has been sprucing itself up for property investors from across the globe in the recent past with significant success. It also has a lot of allure for GCC buyers due to its location and residency options. 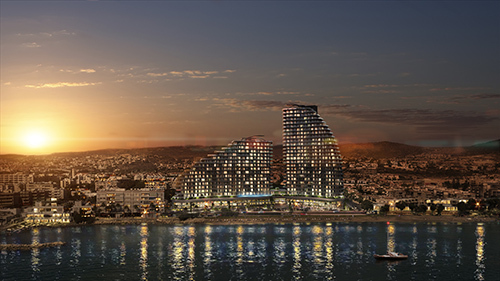 Neapolis is one of the most significant planned mixed use developments of its kind in the Mediterranean and probably in Europe given its size, scope, unique character and eco-smart principles. 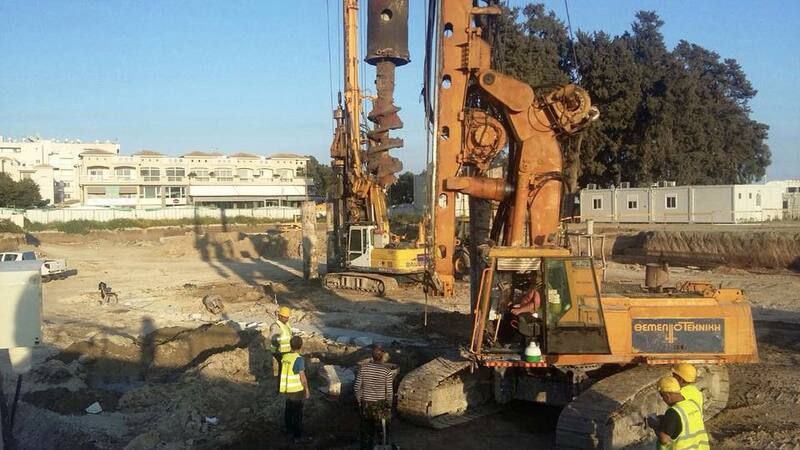 Limassol Del Mar the inaugural stone event ( 6th of October ) will be unveiled by H E the President of Cyprus Mr. Nicos Anastasiades to celebrate the official commencement of construction works . Success continues with the presence of Leptos Estates at International Real Estate and Investment seminars and exhibitions over the last few weeks of September in Beijing, Moscow, London, Dubai, Beirut, Amman and Cairo. Limassol Del Mar, a world-class seafront development in the ultra-desirable coastal Limassol, is delighted to report excellent sales success since launching last year. Latchi Beach Villas is an exclusive seafront project of Leptos Estates and is set by the sandy beaches at the edge of the Akamas Peninsular, with view over the gulf of Polis and Latchi Marina. 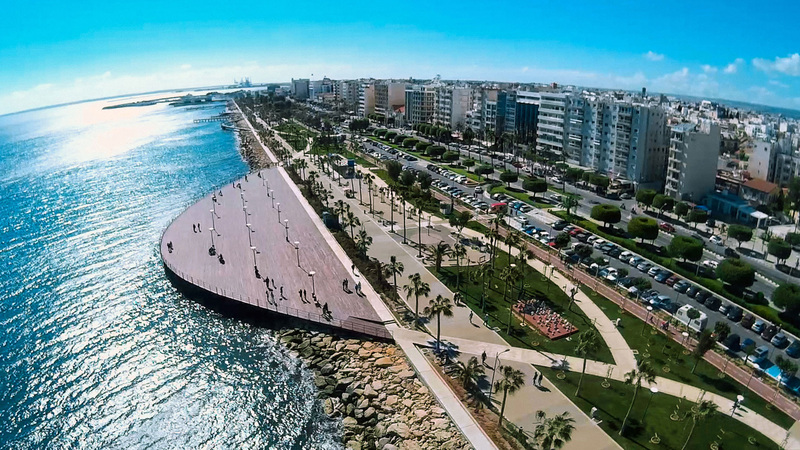 Complete with 300 days of sunshine, stunning landscapes and a recovering property market, Limassol in Cyprus is the new hotspot for real estate investment in the Mediterranean. 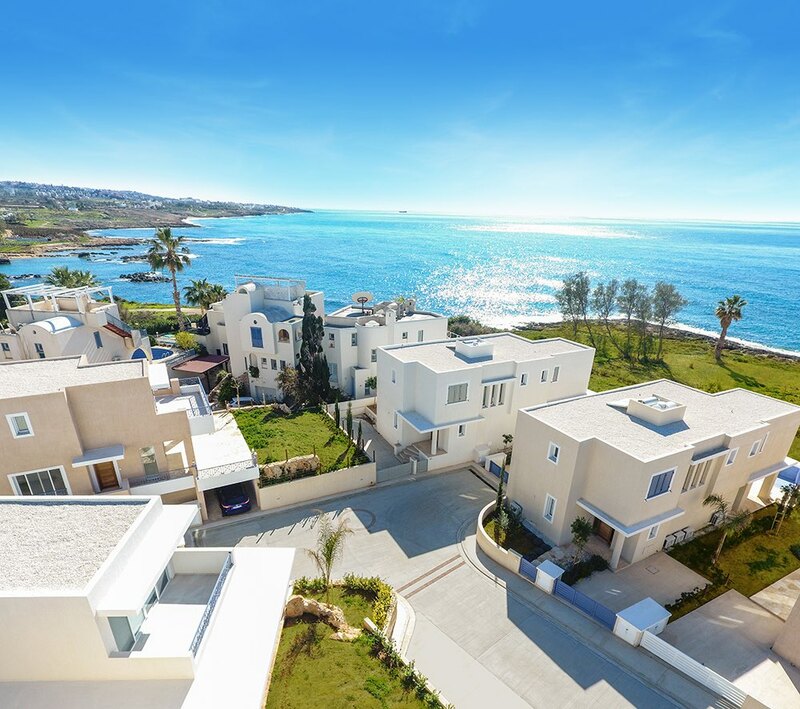 Leptos Kissonerga Beach Villas is a newly completed beachfront luxury project by Leptos Estates in Paphos, located in an exclusive seafront area, midway between the picturesque Paphos Harbour and magnificent Coral Bay which is considered the most attractive bay and sandy beach in Cyprus. 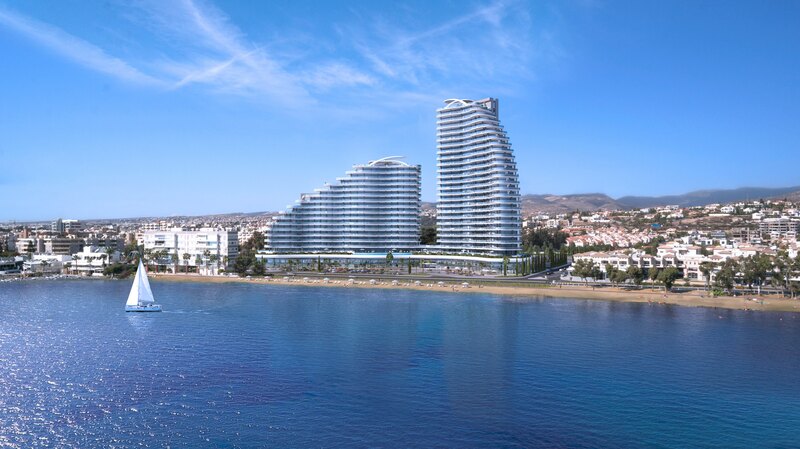 Limassol Del Mar, a world-class seafront development in the desirable coastal location of Limassol in Cyprus, is delighted to report excellent sales success since launching last year. 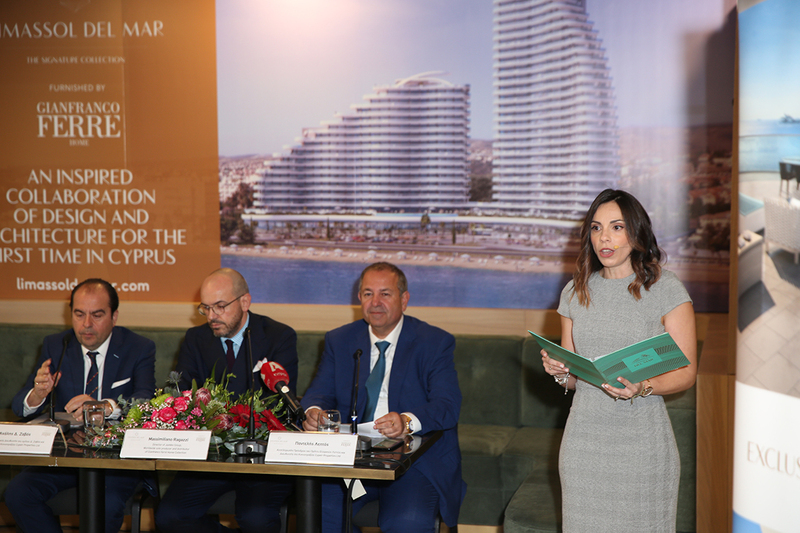 The strong sales position, which has seen the luxury apartments in Buildings A and B nearly sold out, is testament to the project’s international appeal and indicates a rising demand for prime real estate in Cyprus. 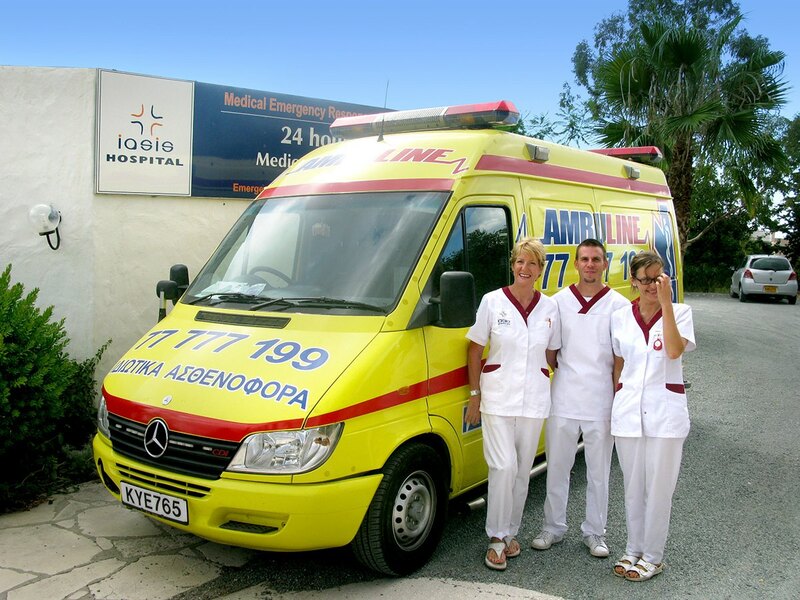 The Kamares Emergency Medical Centre opened in October 2007 and after almost 10 years of success,is continuing to offer an invaluable service to the residents of Kamares and the nearby villages of Tala, Koili and Tremithousa. Local charities benefitted with a substantial amount through the event of the “Kamares Festival” which took place last Saturday at Leptos Kamares Village near Tala, Paphos . 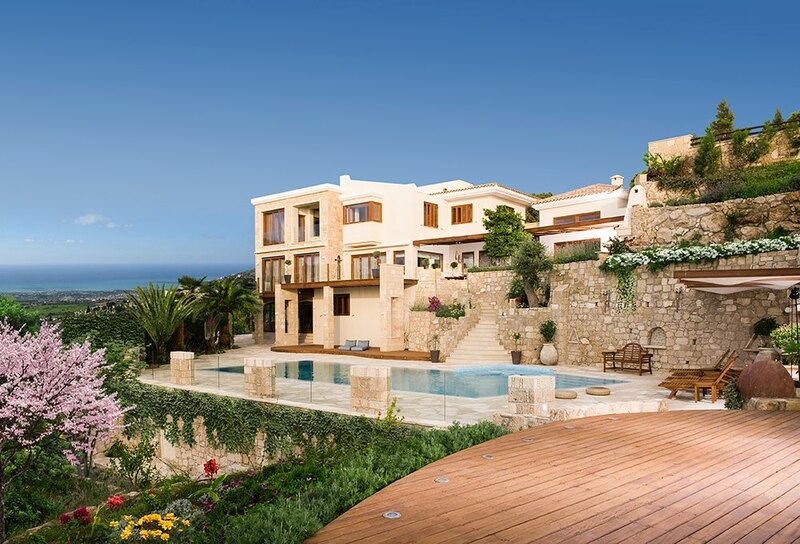 Coral Seas Villas, is a brand new project by Leptos Estates superbly located on the coastline in a pristine area of picturesque Coral Bay, within walking distance to the 5 Star Coral Beach Hotel and Resort, a 10 minute drive to the cosmopolitan Paphos area to the south east and the Akamas natural preserve to the north. 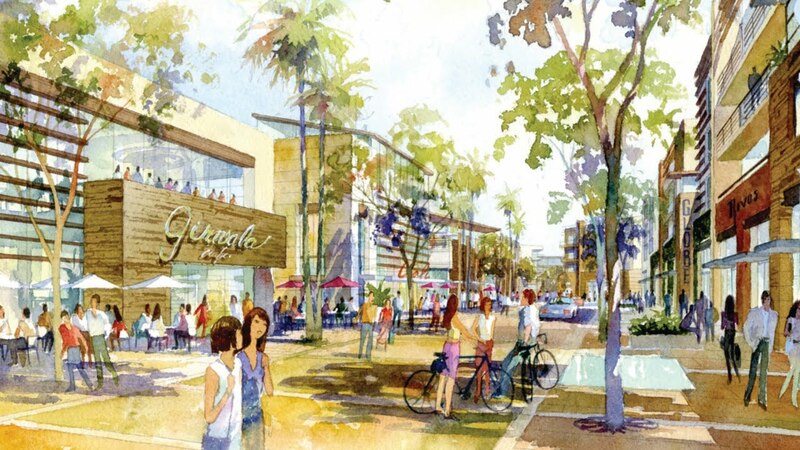 It is one of only a handful of developments in an area unparalleled in its natural beauty. According to a recent article published in the newspaper "The Sunday Times", Limassol Del Mar is included among worldwide developments, adding Cyprus on the map of the most remarkable developments of international caliber. 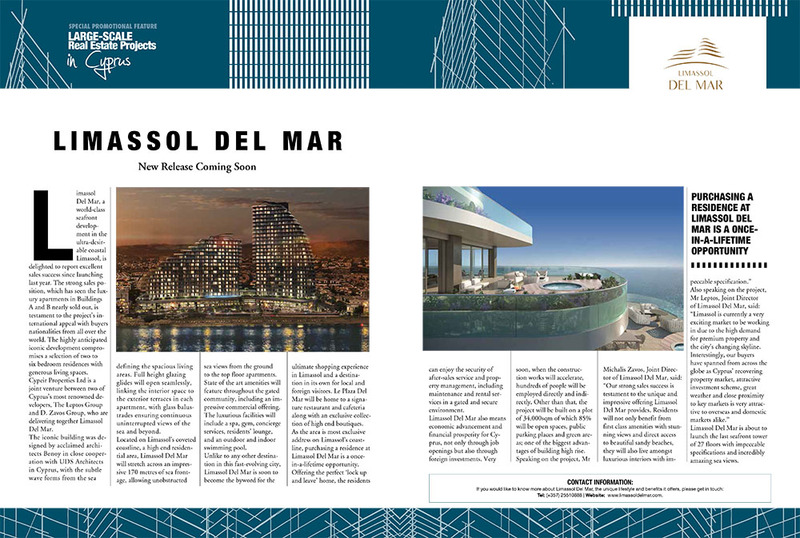 In the article entitled "Global homes to lust after", the famous international newspaper presents Limassol Del Mar as pick of the hottest properties around the world. This unique offer is secured by Leptos Estates, the developers of this beautiful hilltop project boasting breathing views of the Paphos coastline and countryside and the nearby championship Minthis golf course. Cyprus fulfils many factors that an investor looks into: political stability ,economic growth , climate, infrastructure , health and education, religious freedom, safety , security and much more. 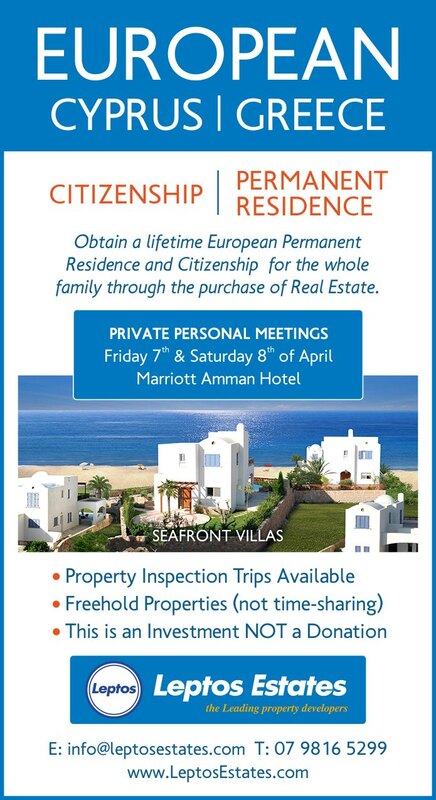 Obtain a lifetime European Permanent Residence and Citizenship through the purchase of Real Estate for the whole family. 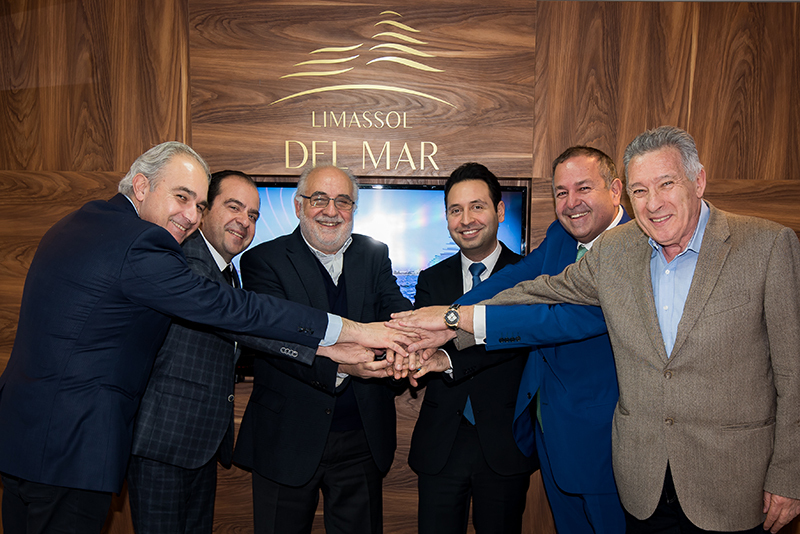 Raving reviews were awarded to the first official presentation of Limassol Del Mar, which took place last Tuesday in the presence of the Minister of Finance and selected members of the financial and business world of Cyprus. 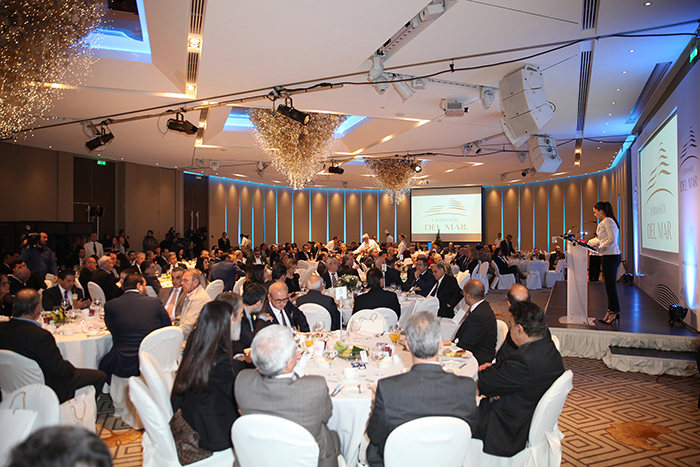 Speaking at the official presentation of the Limassol Del Mar project , Finance minister Harris Georgiades, said that such a large and important development constitutes yet another confirmation that amid difficulties and challenges we have managed to create a new prospect for our Country . Leptos Estates, following the outstanding success of its unique projects in Paphos " Leptos Aphrodite Gardens" and "Leptos Limnaria Gardens" continues to enrich its Property Portfolio in Limassol`s most promising area for real estate with its exclusive new type of development “Leptos Limassol Park". Limassol Del Mar has recently launched its official website limassoldelmar.com, enriched with beautiful images and details about every aspect of the project. 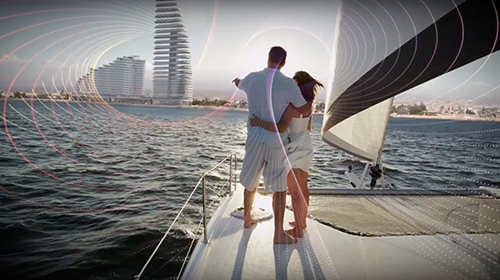 Through the website, visitors will not only get a holistic and informative view of Limassol Del Mar but they will also receive a strong promise, that this upcoming project will become Limassol’s new jewel, right in the heart of the coastal area. It’s January , middle of winter and Leptos Kamares Village reveals its abundant beauties. Flowers, plants and fauna that can only be found in Cyprus invites you to look around, a haven for everyone that loves to observe nature. 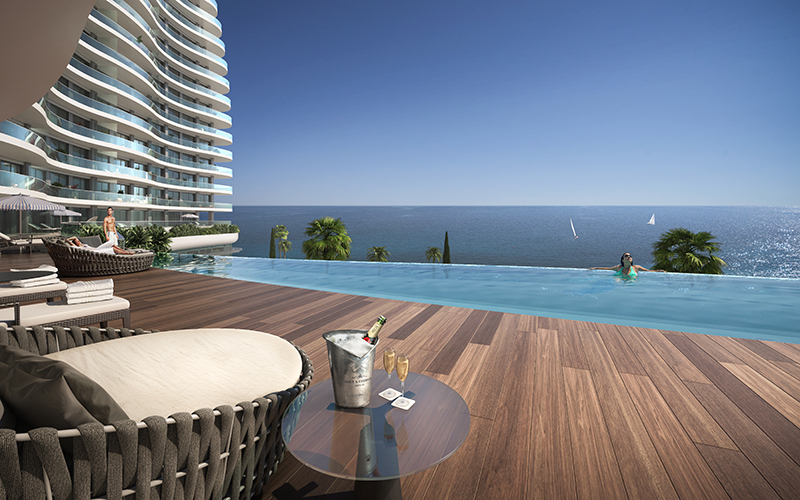 Limassol Del Mar is an exclusive development located in the heart of the Limassol coastal area. 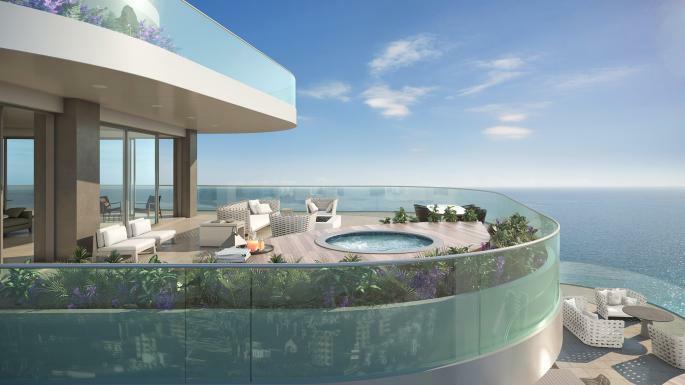 Boasting superb beach views, this stunning new development comprises luxury residences, shops, bars and restaurants, and state-of-the-art facilities, including a spa, gym and clubhouse, as well as an outdoor and indoor swimming pool. 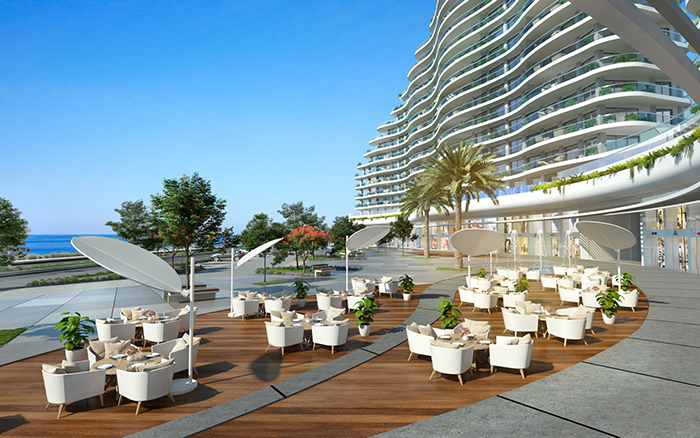 Limassol Del Mar, the stunning new development on the shores of Limassol, announces its collaboration with ara Design International to undertake the interior design of Buildings A and B. Sales of the apartments on buildings A and B have already exceeded 40%, recording an unprecedented momentum for Limassol Del Mar. This significant percentage in pre-sales constitutes a market record, taking into consideration the short period of time in which it was accomplished. 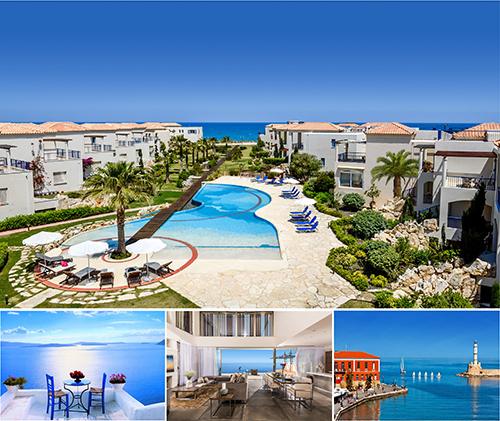 Leptos Estates is proud to announce the launch of its new “Show House” at “Venus Gardens” one of the most beautiful sea view developments in the Paphos region. 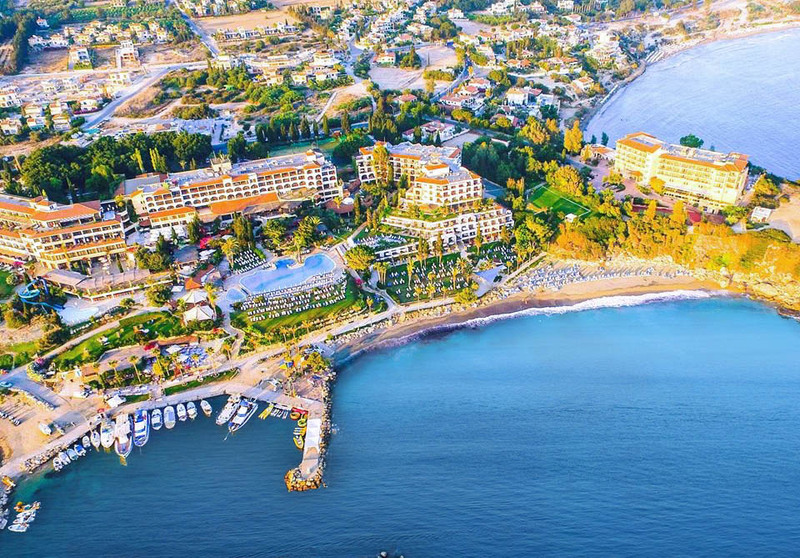 Discover the unbeatable beauty of the “Golden Mile”, a part of the Paphos coastline situated between picturesque Paphos Harbour and the magnificent beaches of Coral Bay. “Coral Seas Villas” is a brand new project by Leptos Estates and has been the best selling development to overseas buyers for this Summer. 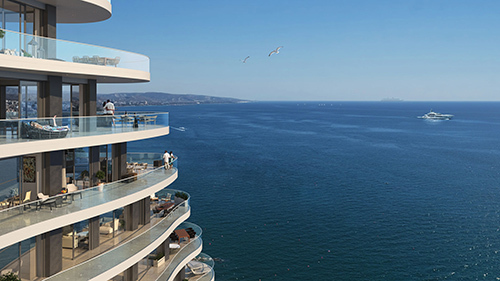 Limassol Del mar expresses the island's 'new wave' of architecture through its unique High-rise Curvilinear design, that fully capitalizes on the plot's 170 meters long sea frontage, enabling every single apartment of the development to benefit breath-taking views of the Mediterranean Sea from every angle. 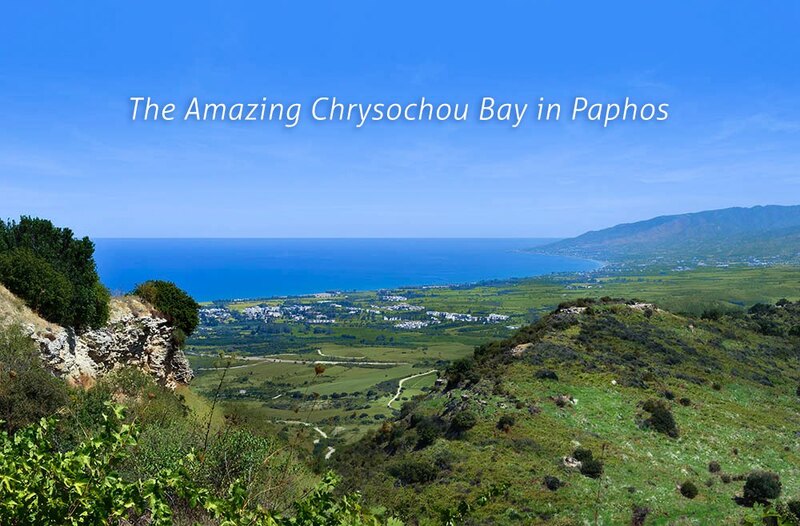 The area of Coral Bay is one of the most beautiful areas in Cyprus and especially in Paphos. It is a buzzing tourist resort, located 12 kilometres northwest of the city of Paphos, next to the national park of Akamas and the picturesque village of Peyia. 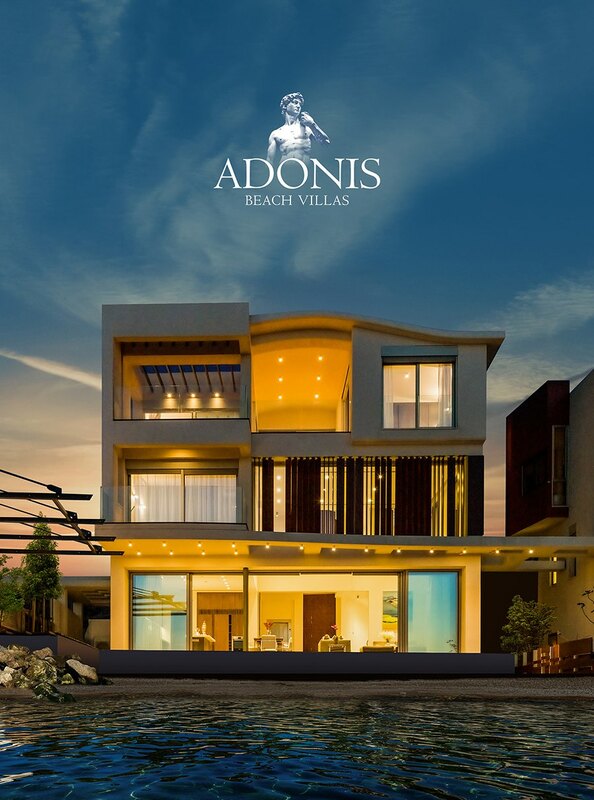 Adonis Beach Villas is an exclusive super modern and luxury beachfront development offering to the lucky buyers and investors a remarkable way of living with extraordinary finishes, services, facilities and amenities. Set on the edge of the peaceful village of Mandria, close to the sea, in an ideal location only 10 minutes away from Paphos International Airport and equidistant from the championship golf courses of Aphrodite Hills and Secret Valley and close to the famous landmark of Petra Tou Romiou, the mythological birth place of Aphrodite. Aphrodite Gardens is set to be the most luxurious, gated resort residence in Paphos and at the same time it proves to be a very successful and fast selling project, due its ideal location, nice style, affordable prices and the many amenities available. Leptos Venus Gardens is a unique modern Resort located on a hilltop just a short walk from the Paphos western coastline and offering magnificent views of the Mediterranean Sea. Coral Seas Villas, is a brand new project by Leptos Estates superbly located on the coastline in a pristine area of picturesque Coral Bay. 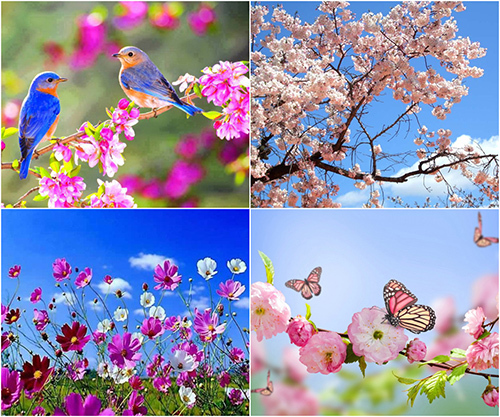 Its early March, the first month of Spring, the most beautiful and amazing season when Cyprus reveals its abundant beauty. A bright full moon was added as a gift during Christmas holidays the last one of the year, marking the time when the nights are long and dark. Venus Gardens is a unique modern Resort, perfectly located on a hill top just a short walk from the Paphos western coastline offering beautiful views to the Mediterranean Sea. 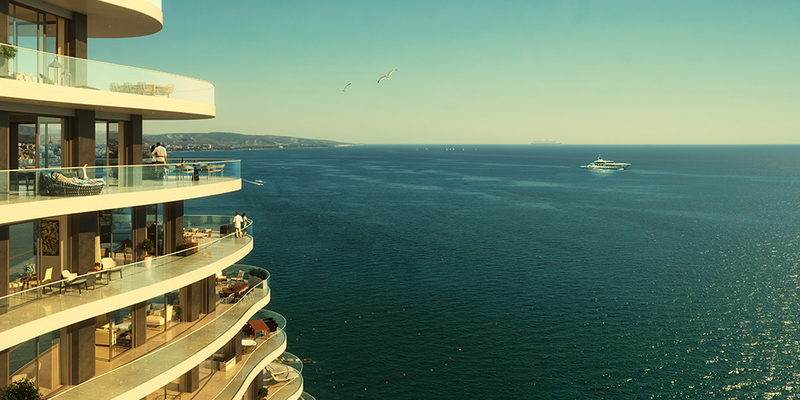 We hold what we believe to be a unique portfolio of stunning seafront properties for the whole of the Mediterranean region. 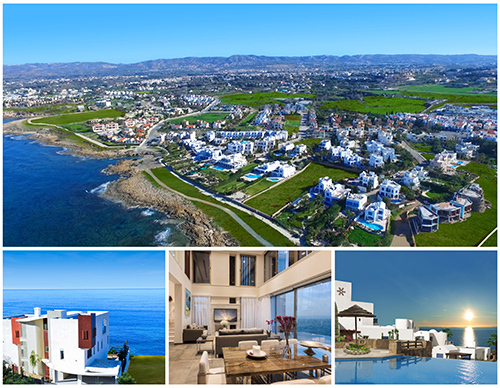 In a nutshell, the Leptos Group currently has 20 seafront and beachfront developments, in the most beautiful areas of Paphos, Limassol and the spectacular Greek Islands of Crete, Santorini and Paros. 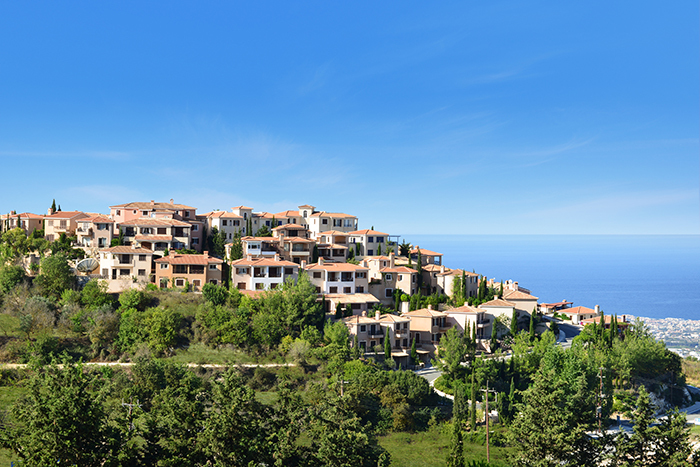 Paphos and especially the Leptos Aphrodite Gardens has been the best selling area and development to overseas property buyers for the first six months of 2015. 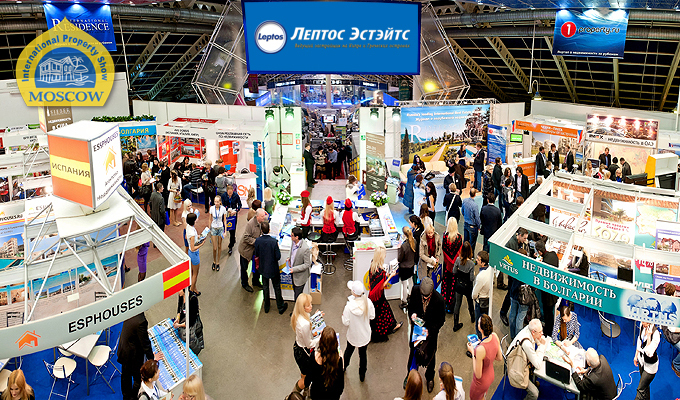 The presence of Leptos Estates at the " Moscow Overseas Property and Investment Show " which was held in Tishinka Exhibition Hall in the center of Moscow this week, was marked with great success. Adonis Beach Villas is Leptos Estates latest luxurious development set in one of the most desirable locations in Paphos, midway between the bustling medieval harbour of Paphos and the blue flag sandy beaches of the picturesque Coral Bay. 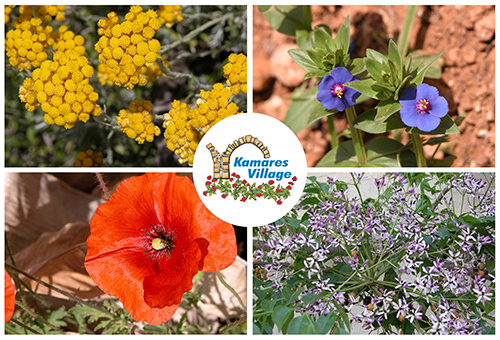 It’s February, the last month of winter and Leptos Kamares Village reveals its abundant beauties. Flowers, plants and fauna that can only be found in Cyprus invites you to look around, a haven for everyone that loves to observe nature. Leptos Kissonerga Beach Villas II is a new beachfront luxury project by Leptos Estates in Paphos, located in an exclusive seafront area, midway between the picturesque Paphos Harbour and magnificent Coral Bay which is considered the most attractive bay and sandy beach in Cyprus. Leptos Estates, the leading real estate developer in Cyprus and Greece and a member of the Leptos Group, has announced the official opening of it’s new Beijing Office. The new office, located at the Vantone Center, Jia No 6, Chaoyangmenwai Street, Beijing Central Business District (CBD), is at a prime location strategically placed at the heart of Beijing’s business activity. 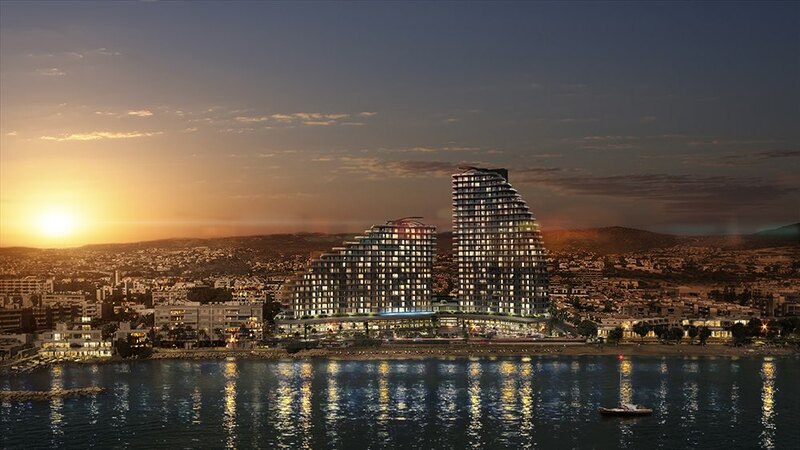 Leptos Group within the reorganization and expansion of its business has recently opened a new Sales and Marketing office at EDEN Beach Apartments which is adjacent to the cosmopolitan and "revived" seafront the Akti Olympion, an amazing urban Beach. 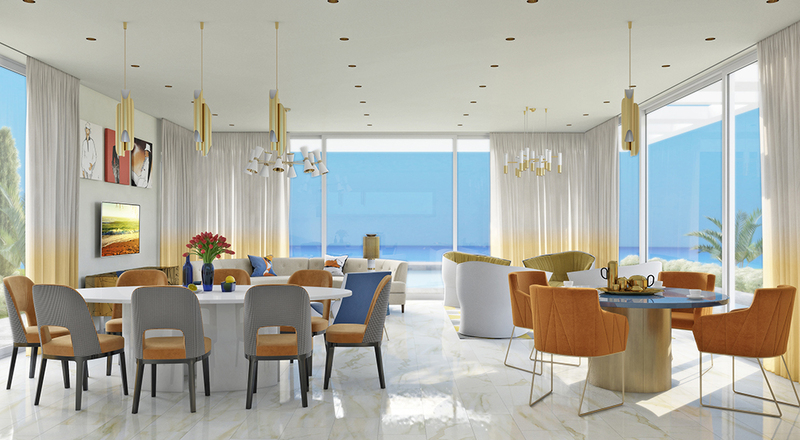 Leptos Estates is proud to announce the launch of its new show flat at “Akamandis Gardens” one of the most beautiful sea view developments in the Paphos region. 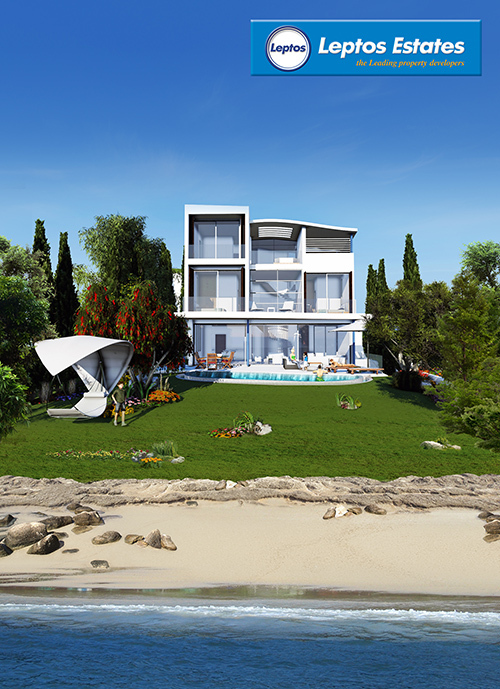 Leptos Estates released its new line of elegant villas in unique modern resorts that were designed especially to be over and above the 500.000 euro mark, so as to be qualified for nationalization applicants. 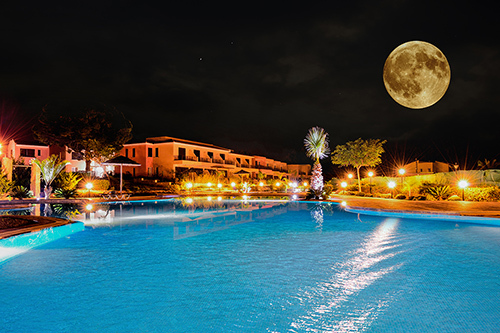 The beautiful and impressive Coral Beach Hotel & Resort, part of the Leptos Group, which is located in the enchanting Coral Bay area in Paphos, organizes on a weekly basis with great success traditional Cypriot nights where over 300 people attend the feast and stay up until late at night. Leptos Estates is proud to announce the launch of its new show flat at “Aphrodite Gardens” one of the most beautiful and modern developments in the paphos region. The exclusive "Leptos Aphrodite Gardens" is set to be the most luxurious gated resort residence in Paphos with a very good selection of 1, 2 and 3 bedroom apartments, penthouses and villas for sale. 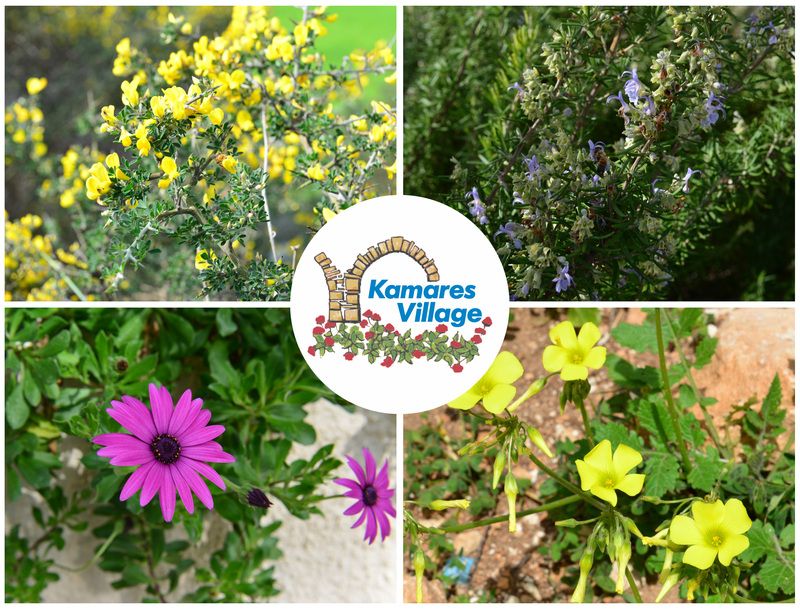 Its March the first month of spring and Leptos Kamares Village reveals its many beauties.Our country’s flora has many things to show. Flowers and plants that one can find only in Cyprus are inviting you to look around, a haven for every one that loves to observe nature.Although the period of efflorescence has only just begun our country – has something to show each and every month throughout the year.Rare plants, gorgeous and unique flowers surface during this period in the beautiful district of Paphos and more specifically in Leptos Kamares Village, Tala. Leptos Venus Gardens is a unique modern Resort located just a short walk from the Paphos coastline and the blue waters of the Mediterranean Sea. 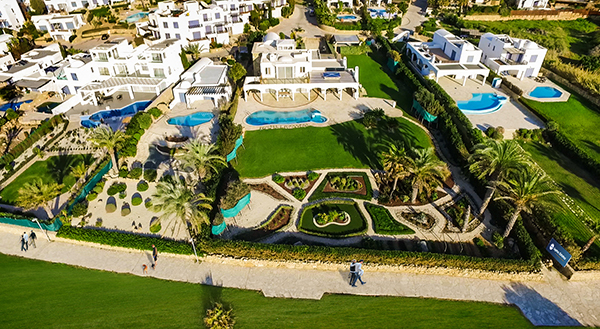 The first turf was turned in 1978 and since this date the village of Kamares has grown into a unique project with a reputation to be one of the best addresses in the Eastern Mediterranean. It is not surprising that so many people from countless countries want to live here. 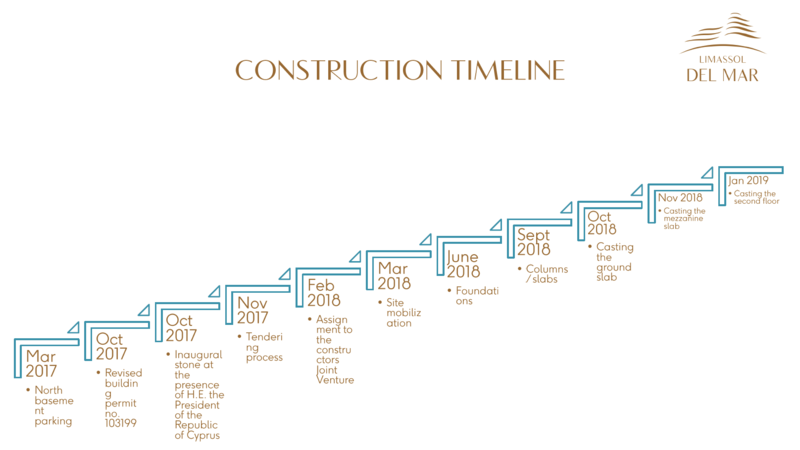 Following the success of inaugural sell out of phase I in June of 2013, this announcement comes at the right time to prove that Paphos and above all Leptos Estates are still the top sellers in Cyprus although we are in the middle of a financial crisis especially in the Real Estate sector worldwide. 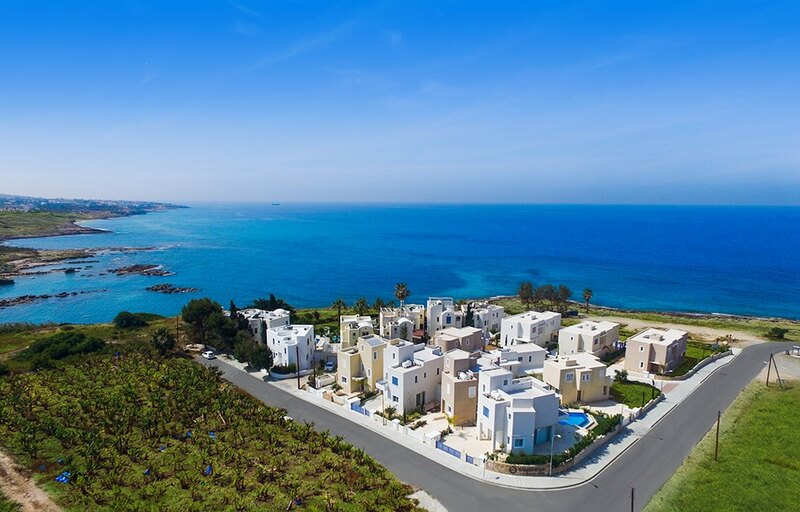 Paphos, is already a very popular attractive destination and has topped the sales of properties to foreign buyers and investors with 50% of the total sales in all of Cyprus. 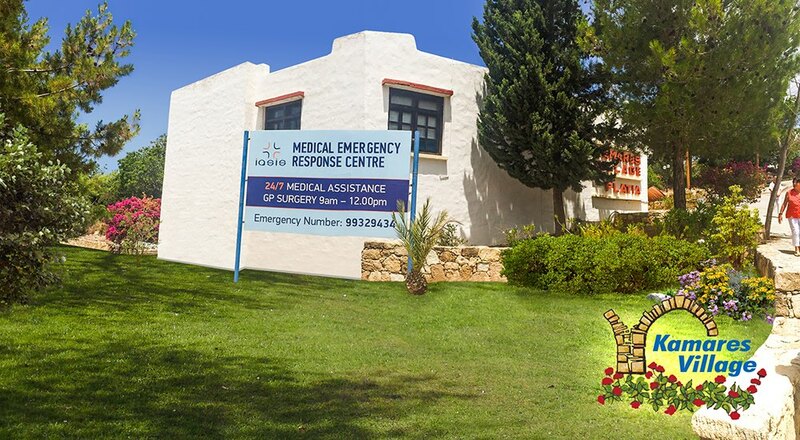 The Kamares Emergency Medical Centre was opened during October 2007 and following six years of success, is continuing to offer an invaluable service to the residents of the Kamares Village and the nearby villages of Tala, Koili and Tremithousa. The Coral Beach Hotel & Resort features one large outdoor fresh water Olympic Size Swimming Pool according to the rules as defined by the La Federatio Internationale de Natation (FINA). The Olympic pool and the mild Winter Climate of Paphos attracts many Olympic athletes as well as swimming club associations to choose this location for their warm winter training in the lead up to major competitions. Leptos Calypso Hotels & Resorts understands the demands of today’s Family traveller, with expectations that are constantly increasing. 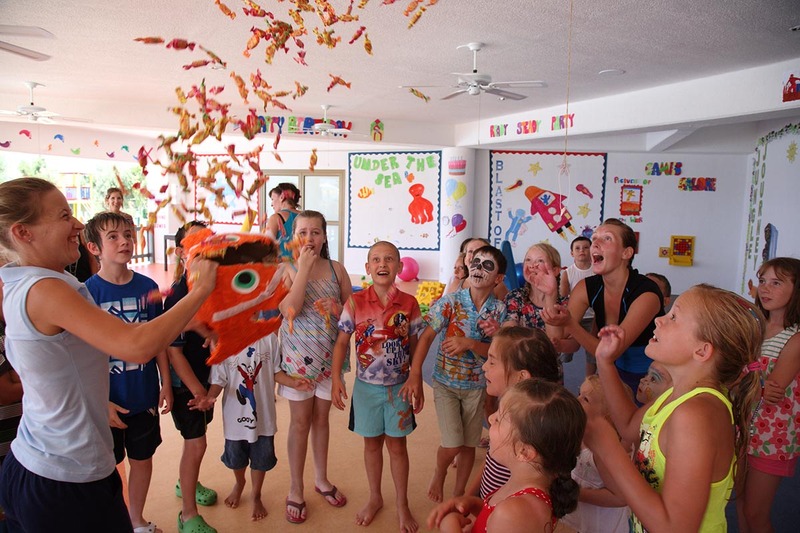 The five star Coral Beach Hotel & Resort is perhaps one of the most exciting resorts on the island with a particular focus on families with children. 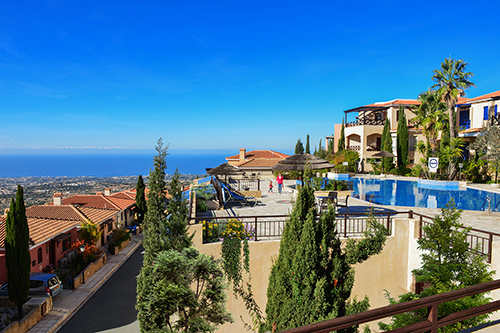 Venus Gardens is a unique Residential Resort located just a short walk from the Paphos coastline and the blue waters of the Mediterranean Sea. 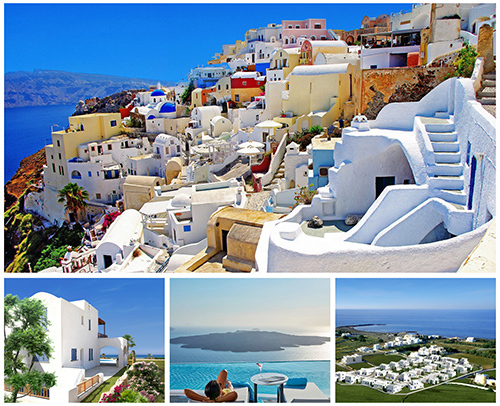 These hill top homes have a relaxing contemporary design with distinct Mediterranean features. All living areas have direct access to large verandas, terraces and gardens which surround the properties and all interior designs allow the sun and air to flow through. 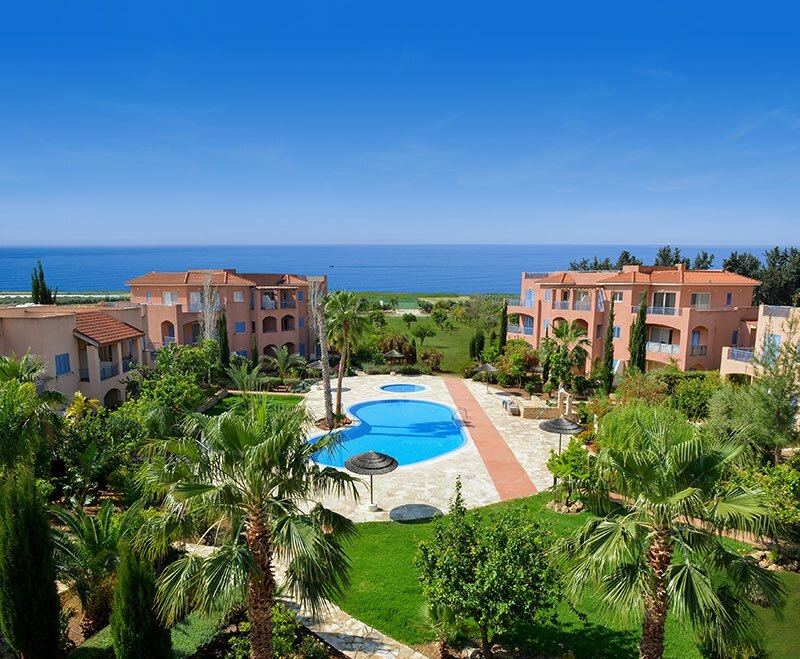 Although we are in the middle of a financial crisis in Cyprus the “Leptos Aphrodite Gardens” proves to be a very successful and a fast selling project due its location, style, price and amenities available. Don't miss this unique opportunity to buy a home of your Dreams in Paphos. 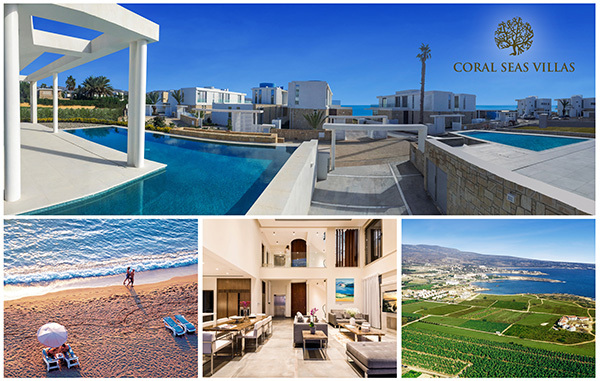 The new Leptos ‘‘Coral Seas Villas’’ comprises of 3,4 and 5 bedrooms well presented seafront homes ideally located between the tranquil Sea Caves and the sandy beaches of Coral Bay. 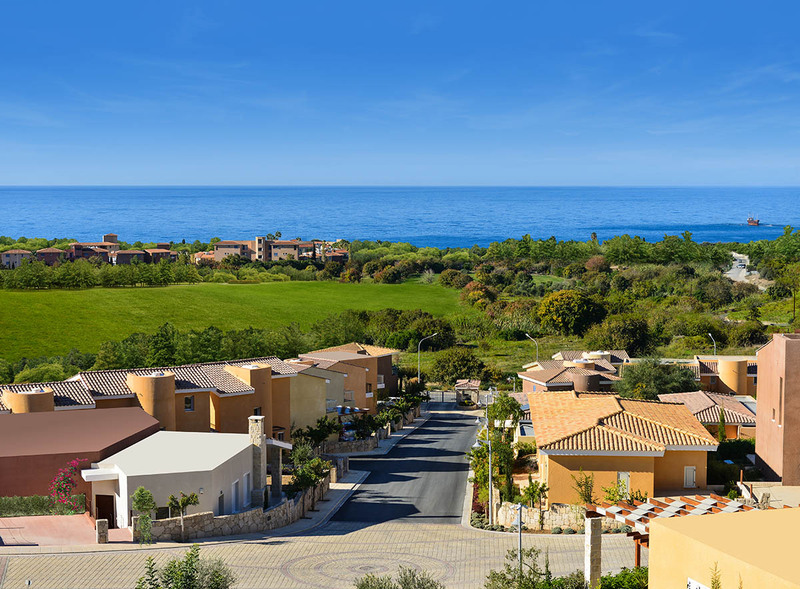 These fabulous plots of land are located on a gently sloping hillside overlooking the sea on the outskirts of Paphos town and just 300m from the sea and the nearby luxury beach hotels, in an exclusive coastal area, within walking distance of the shops and nightlife. Leptos Estates is proud to announce the launch of its our new show flat at “Aphrodite Gardens” one of the most beautiful and modern developments in the Paphos region. The Mayor of Limassol Mr. Andreas Christou during his short speech for the opening ceremony of the Eden Beach Apartments last Friday gave his warmest congratulations to both Mr. Michael Zavos and Mr. Pantelis Leptos for joining their strengths and creating a precious jewel for the town of Limassol. Leptos “Aphrodite” is the envied example of Mediterranean coastal properties. Carefully set on the Cretan shores this unique development displays an intricate mix of design, comfort and construction, inspired by the true essence of Mediterranean living. Extensive use of local materials and lush landscaped gardens of local character, ensure the development is at one with the environment. Another Sold Out by the Leptos Estates in Paphos. All Properties of Leptos Kings Palace project next to the west coast of Kato Paphos have been sold out beginning of this month. Investors and other buyers are coming mainly from Russia,China and Scandinavia even locals buyers from the capital have choosen this beautiful development. Pantelis Leptos the director of the Leptos Group of companies is pround to announce that the Leptos Latchi Beach Villas is the quality and Luxury Living by the Sea. 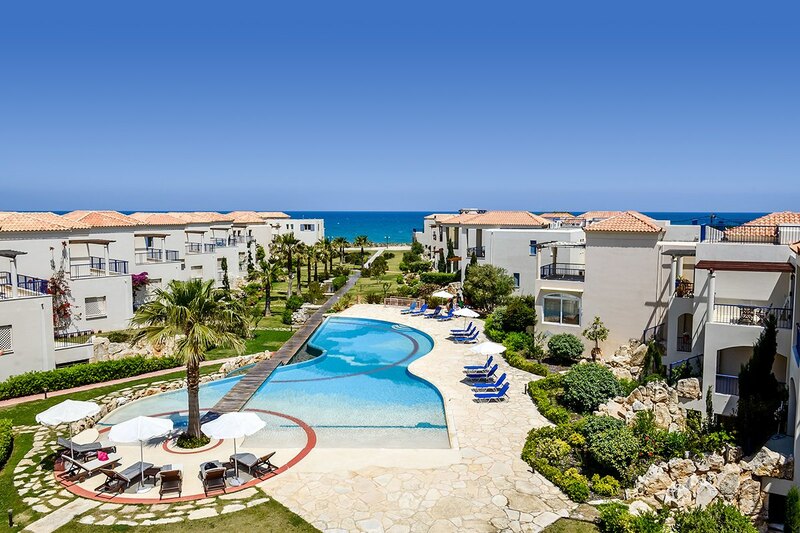 All 100 luxury seafront villas of Leptos Estates in the Leptos Apollo Beach Villas project by the seafront of Chlorakas coast have been sold out during the crisis. 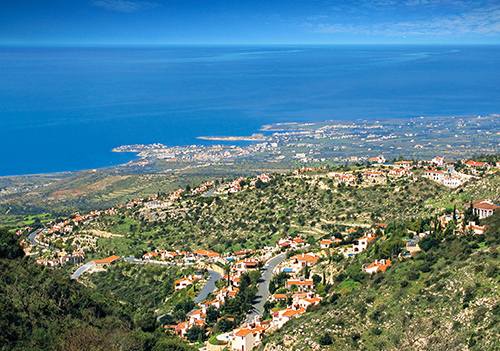 Vikla Village is located on a hilltop boasting breathtaking views of the Paphos coastline and the nearby Tsada village with its traditional narrow streets, coffee shops, tavernas and close to the 18 holes championship golf course, with its Byzantine monastery, Stavros tis Mythis. 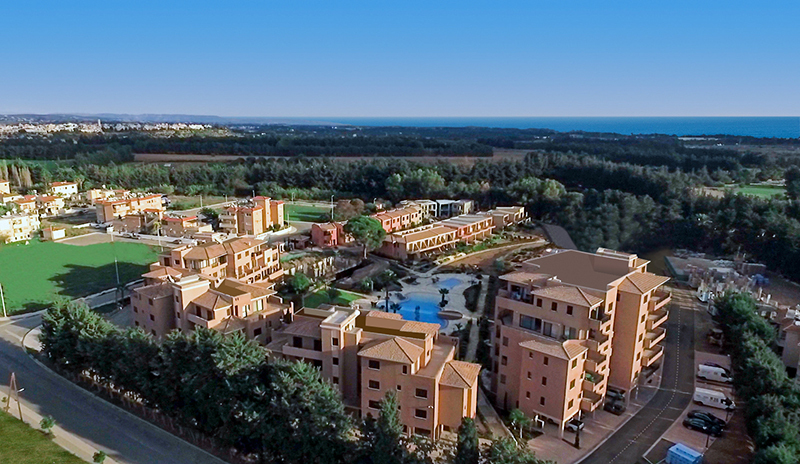 The portfolio of Leptos Estates seafront properties is unique for the whole Eastern Meditteranean region. In its nutshell the company has added resently another three sea front developments the “Sea Caves villas” “Sklinikari beach villas” and “Kerati Beach villas” all situated in the attractive area of Coral Bay. 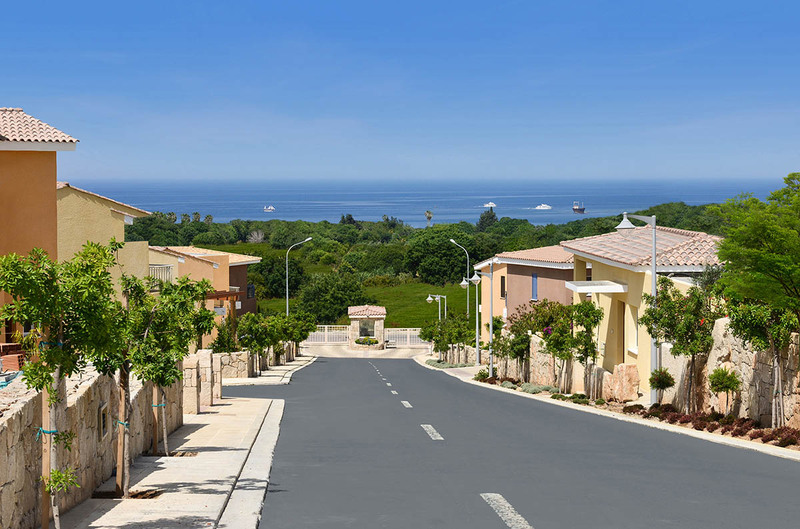 Mr. Pantelis Leptos Director of Leptos Estates is proud to announce the launch of its new show villa at Limnaria Gardens” one of the most beautiful Sea View developments in the paphos region. 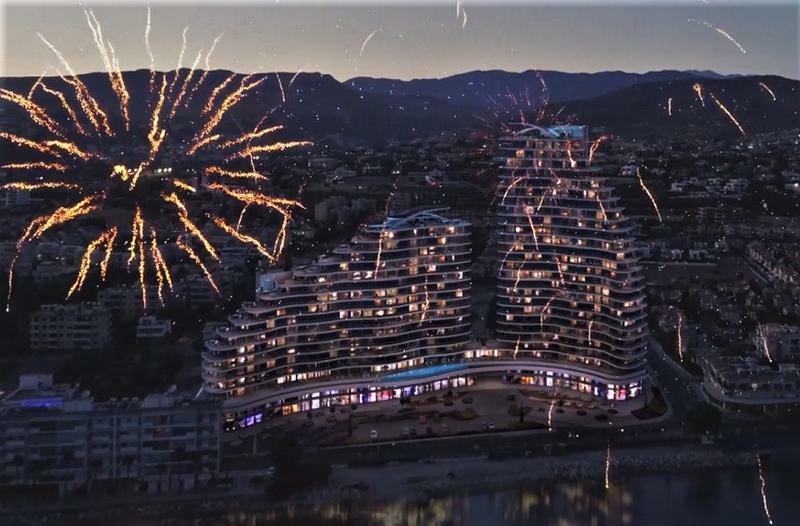 Pantelis Leptos, the Vice Chairman of Leptos Group stated that the EDEN Beach Apartments although it has only been on the market for only a year we have already sold 70% of the development. 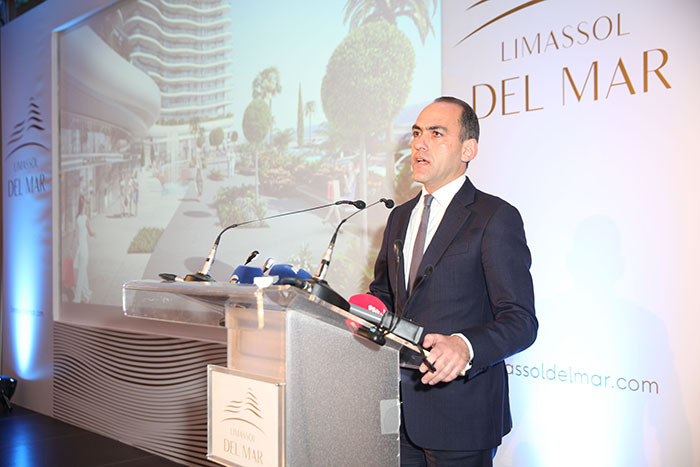 Pantelis Leptos, the Vice Chairman of Leptos Group and Director of Leptos Estates introduces Del Mar, as an increasing number of high-rise buildings will soon start carving the island’s skyline, the joint venture of the Leptos Group and the D. Zavos Group are setting the trend with Del Mar in Limassol. “Leptos Aphrodite Sea-front” is the envied example of Mediterranean coastal properties. Carefully set on the Cretan shores this unique development displays an intricate mix of design, comfort and construction, inspired by the true essence of Mediterranean living. Extensive use of local materials and lush landscaped gardens of local character, ensure the development is at one with the environment. 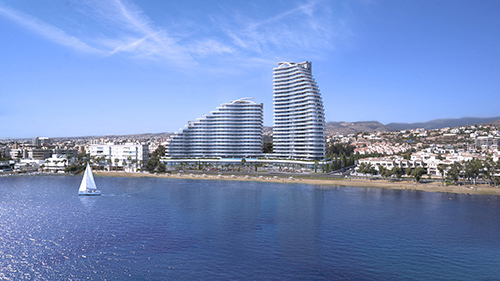 Limassol Del Mar will express the island’s ‘new wave’ of architecture through its unique High-rise Curvilinear design, that fully capitalises on the plot’s 170 meters long sea frontage, enabling every single apartment of the development to benefit from direct wide-angle sea views. 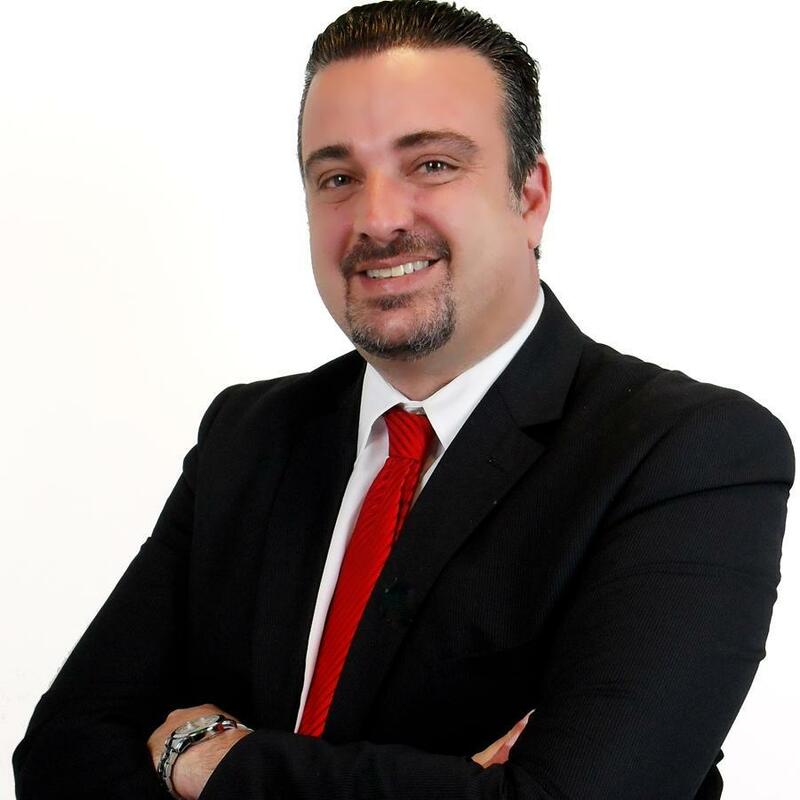 Pantelis Leptos, the Director of Leptos Estates presents the exclusive "Leptos Aphrodite Gardens" is setto be the most luxurious gated resort residence in Paphos with a very good selection of 1, 2 and 3 bedroom apartments and penthouses for sale. 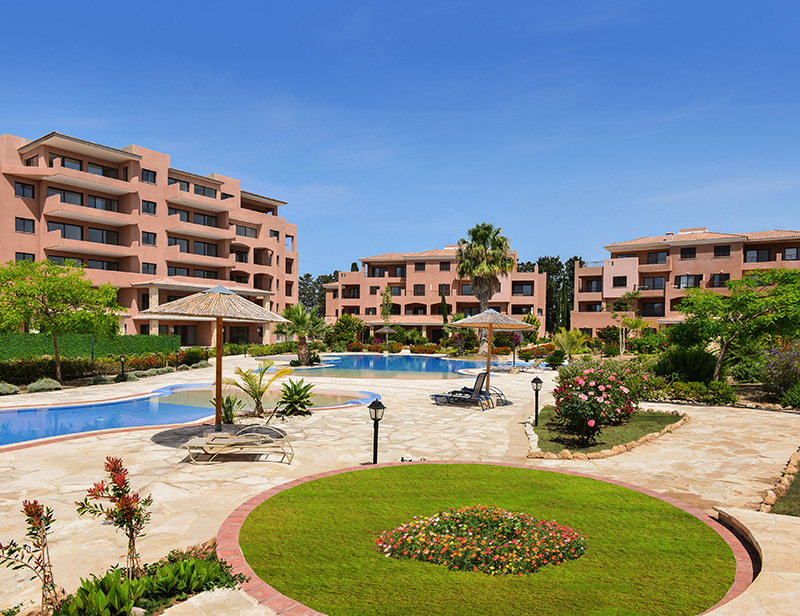 It is superbly located in Kato Paphos within walking distance to the amenities and facilities and the municipal the sandy beaches.